Oh, Mouse Pink is hungry and wants to eat five apples. But there are only three apples here. Kids, come and help little Pink! The free addition and subtraction within 10 in Stage 3 include +1, +2, -1, -2. Kids are free to choose addition or subtraction to find the answer. This is interesting and details the subtraction steps. And it can be combined with the leaning and applying of odd and even numbers. Delicate images and nice zither incidental music will surely let your kids fall in love with Little Mouse House. Hello, Welcome to Little Mouse House! Worried about not being able to find more meaningful learning games for 3 to 6-year-old kids? 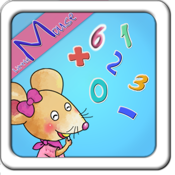 The author of Little Mouse House is a mother with over 20 years of experience in early childhood education, who has designed a lot of fun math games and music games for kids. The game here is fun and helps your baby become more confident.Are you ready? Give it a try! Math can be so fun. Music can be so interesting. Hope the games of Little Mouse House can accompany the growth of your kids with happy gaming experience. It is very important for pre-school children to know addition within 10 well. Learning and proficient applying of addition within 10 can help kids pick up subtraction within 10 and addition and subtraction within 20 and within 100 more easily. Delicious numbers (2) is the detailing and consolidation based on Delicious numbers (1) which helps kids learn the decomposition and composition within 10. Meanwhile, subtraction and continuous addition and continuous subtraction are also included. The game not only has meticulous teaching and learning but also contains the part of autonomous game. Kids can make questions by themselves, which improves their interest in learning and helps them master addition and subtraction within 10 while playing games.